Coin grading is a very important part of numismatics. When you grade a coin, you’re evaluating its state of preservation based on the amount of wear that it has. There are two basic coin grades: uncirculated and circulated. An uncirculated coin is one that has no evidence of wear from circulation. A circulated coin has some degree of wear, though the extent of wear can be anything from the slightest hint of rub on the highest points of a coin to deep wear that has virtually obliterated the coin’s design. One of the most widely used coin grading standards has been devised by the American Numismatic Association (ANA). The Official ANA Grading Standards for United States Coins is an invaluable book that coin collectors and investors can use to grade their own coins. Proof – A presentation-quality coin that has been struck by a specially prepared die. Proof coins are made from polished planchets and are usually struck at least twice to bring up even the minutest details. Proof does not refer to a condition but, rather, a method of manufacture. “Mint state” (or uncirculated) is the implied grade for proof coins. It should be noted that some proof coins have inadvertently entered circulation and show evidence of wear; these pieces are thus graded according to the standards below, except with the “PR” (Proof) adjective used before the numerical grade (i.e., PR 40, PR 50, PR 55). Perfect Uncirculated (MS 70) – This is a coin that’s in unworn condition and presents no imperfections under 5X magnification. There will be no evidence of scratches, handling, or contact from other coins. Regular-issue MS 70 coins are very rare. Choice Uncirculated (MS 65) – This is an above-average uncirculated coin that shows few contact marks on the surface or rim. MS 65 coins may have light or brilliant toning. Choice About Uncirculated (AU 55) – There will be only slight evidence of wear on the highest points of the coin design. Luster may be largely present on most of the coin. About Uncirculated (AU 50) – A light trace of wear will be evident across the surface of the coin, but at least half of the original mint luster should still be intact. Choice Extremely Fine (EF 45) – The highest points of the coin will show light wear, but most details should still be sharp. Mint luster may be evident near protected areas of the surface, such as between letters and around other design devices. Extremely Fine (EF 40) – The coin’s design shows light, even wear throughout but all features remain sharp. Traces of mint luster may be evident. Choice Very Fine (VF 30) – Light, even wear will proliferate across the surface of the coin as well as all high points. Lettering and the date should remain sharp. Very Fine (VF 20) – Moderate wear has occurred across the coin, including the high points and surfaces. Major details will remain clear. Fine (F 12) – Moderate, even considerable, wear will show across the coin. The design should still appear quite bold, with the heaviest details (such as major facial features) still clearly evident. Very Good (VG 8) – This grade denotes a well-worn coin, with its main features appearing clear and strong, though perhaps somewhat flat. Good 4 (G 4) – This is a heavily worn coin that shows a visible design. Major details are quite faint, and many are completely flat. A “Good” coin is the lowest-collectible condition that most numismatists will bother collecting, though this is a downright undesirable grade for common, modern coins. 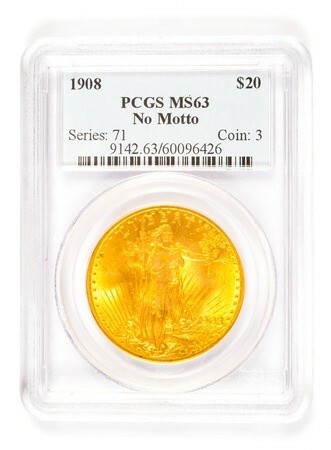 Many coin collectors will only pursue Good 4 coins if they are rare or valuable. About Good (AG 3) – AG 3 describes a coin that is very heavily worn with most areas of lettering, the date, or legend worn smooth. In fact, the date may be barely legible. Few coins are collected in a grade of AG 3, with the exception of 18th- and early 19th-century coinage.